Get ready to Train Like a Martian! From April 18-24, The Mars Generation is sponsoring a week of activities that will encourage individuals to see physical activity, STEM education and space exploration in a whole new way. You can click here to get updates for the event. Interested in possibly hosting a local community #TrainLikeAMartian event on April 24? Click here for more information! Want to get entered in prize drawings right away. Click here to learn how. On April 24th, 2016 European Space Agency Astronaut Tim Peake of the UK will make his mark as the second astronaut to run a marathon in space. Peake will be running the 2016 London Marathon from the International Space Station. Join The Mars Generation help cheer on Tim Peake by participating in our Train Like a Martian fitness challenge the week leading up to the London Marathon. You don’t have to Train Like a Martian alone, grab a friend at school, a group of co-workers or find someone across the world on social media. This event will give opportunities to connect with people of similar interests all across the world. Whether you find someone in your area or someone on Twitter in a different country, get together for a fun week of joining together as a community and pushing each other to be better. Whether you’re continuing on a regular fitness path or starting for the first time, this week will help encourage health and fitness across the globe. Share fitness tips, challenges and triumphs during this event. Those participating will share the benefits of living healthy, balanced lifestyle while helping to encourage those observing the event to do the same. Join us in making fitness a trending topic leading up to the London Marathon. If you believe in space exploration and want others to do the same, this event is the perfect way to start the conversation. Through your participation and progress during this week-long event, those who are unaware or uneducated in space exploration will have the opportunity to connect and ask questions. This is a huge step in adding a rally behind space exploration to support current and future missions. Those who are already in STEM related fields can probably remember a time in their life when they chose that path. Let’s join in and make this event one of those moments for someone. Through promotion and participation of this event, together we can encourage young children and students to join the STEM team. If you can help inspire one person to have an interest in STEM education, then we are on the way to inspiring a whole generation. Behind this week-long event is an even greater long-term mission. TMG mission is to excite those young and old about space, STEM education and an understanding of the importance of those two elements to the future of humankind. The goal of TMG is to advance public interest in human space exploration and advocate for NASA’s journey to Mars. Get a taste of TMG community during this week-long event and you’ll see why the mission is so important. Challenge yourself and challenge others through fun and friendly fitness competition. You don’t have to run faster than the person next to you, just work harder. Everyone will have the opportunity to enter their workouts into TMG tracking spreadsheet to show their progress and see how they compare with other participants. Did someone say free stuff? You heard it right. Combining friendly competition with fundraising, the individual who raises the most will be awarded a TMG sweatshirt and up to five TMG t-shirts will be awarded to the group will the most funds raised. Individuals who raise $100 or more will be entered into a drawing for patches, space books, TMG t-shirts, among much more. Those individuals who raise $500 or more will be entered into a premium drawing with a grand prize of a Google Hangout session with Astronaut Abby and perhaps a few more surprise guests! 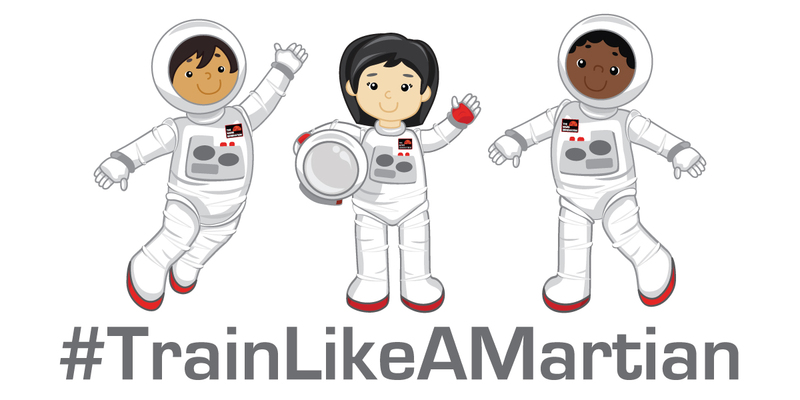 Tweet with the #TrainLikeAMartian hashtag to share your activities and successes and to be entered into a daily drawing for additional prizes and notoriety mentions on April 25th. You can be entered for prize drawings that are happening now each week. Click here to learn more! Now that we’ve convinced you to be a part of the event, here’s a few ways you can join in on the fun!